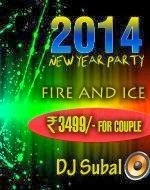 Fire N Ice where DJ Subal will be playing the all popular party music of Bollywood & Hollywood. Package which includes eight unlimited pass around snacks with option of both veg. & non.veg. Main course includes twelve dishes and five desserts with unlimited drinks.